The shotgun is a close-ranged weapon with spread area damage. Any mutants close enough would get badly hit. The movement speed during shooting is comparately high among other wepaons (the pistols have a flexibility advantage of 200% over the shotguns) but one can release the shoot button during the reload to move faster. However, with a low rate of fire and short range, using this weapon would make one somewhat close to the enemies. One needs to have good health and defense to do close-quarter battles. To avoid getting hit by the mutants, use a poison add-on to slow the mutants and maintain a short distance from them. Note that it is spread area damage, not penetration. This means that any single mutant right in front of the shotgun would absorb all bullets, and no other mutants would get hit. So as to hit multiple mutants, you need to be at a small distance from them when you fire your shotgun. The shotgun can be used as a secondary weapon. 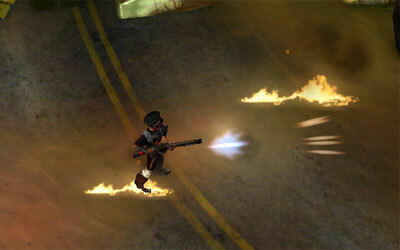 It is a good piece of weapon in deathmatch since the spread area damage allows one to hit an enemy more easily. It is better to use a shotgun to approach tough players in deathmatch since they good at taking cover, making long-ranged weapons less effective on them. Weapons of the same class are essentially the same except with a certain damage and critical chance differences. Carrying 2 shotguns doesn't give you the flexibility of having a variety of weapons. Unless you are putting different add-ons to these shotguns and use them strictly in the sense of deathmatch, there is no added advantage of carrying two shotguns. Carry 2 shotgun like boomstick and gravedigger is good idea?